Where is Pigeon Forge? Find your answer to where is Pigeon Forge, TN plus a map of Pigeon Forge and directions. Also find the answer to where is Gatlinburg and where is Sevierville. Where is Pigeon Forge, TN? Are you looking for directions to Pigeon Forge or need a Pigeon Forge map? Pigeon Forge, TN can be accessed via Interstate 40 from exit 407. Follow the Great Smoky Mountains Parkway (Highway 66 to U.S. 441 to the Great Smoky Mountains) and you arrive in Pigeon Forge between Sevierville and Gatlinburg. The nearest commercial airport is McGhee Tyson Airport in Knoxville, about 45 minutes’ drive west of Pigeon Forge, TN. Gatlinburg, TN is just a short drive from Pigeon Forge and rests on the border of the Great Smoky Mountains National Park along U.S. Highway 441, which connects Gatlinburg to Cherokee, North Carolina through the national park. Gatlinburg can also be accessed via Interstate 40 from exit 407. Follow the Great Smoky Mountains Parkway (Highway 66 to U.S. 441 to the Great Smoky Mountains) at which you will follow the parkway through Sevierville, Pigeon Forge and into Gatlinburg. Sevierville, TN can be accessed via Interstate 40 from exit 407. Follow the Great Smoky Mountains Parkway (Highway 66 to U.S. 441 to the Great Smoky Mountains) and you will arrive in Sevierville. Continue ahead to go to Pigeon Forge and Gatlinburg. 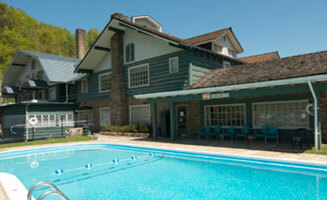 The Pigeon Forge, Gatlinburg and Sevierville area is very accessible by auto travel. Several new roads have recently been constructed in the area, including improvements to Middle Creek Road near Dollywood as well as the new North Parkway, U.S. 448, in Sevierville. 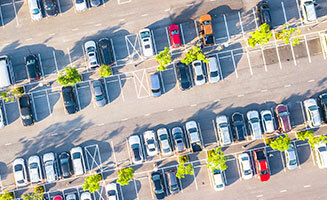 Detailed maps of Pigeon Forge and other local cities can be found at the Tennessee Department of Transportation web site. A map of the Smoky Mountain area is available from PigeonForge.com for printing. 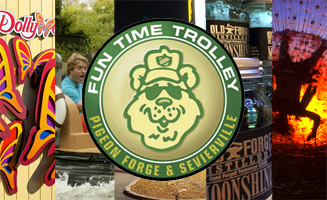 The Fun Time Trolley is a public transportation system in Pigeon Forge, Gatlinburg, and Sevierville, that offers an alternative to driving in the Pigeon Forge Area. The Pigeon Forge and Sevierville Trolley connects with the Gatlinburg Trolley at the Gatlinburg Visitors’ center on the Foothills Parkway (U.S. 441/312, aka “The Spur”) between Pigeon Forge and Gatlinburg.